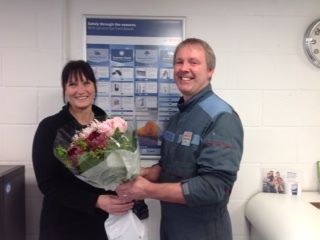 Rob, Rayners’ director thanking Deb, receptionist for four years for all her hard work as the welcoming face of Rayners. Deb will be greatly missed, though will still pop in occasionally to support our new receptionist, Natasha and our Saturday receptionist, Maria. We wish Deb every success in the future and extend a warm welcome to Natasha and Maria who are settling in well to their new roles.